Here is the point where I was originally intending to begin this tale. The initial notion was to undertake this exercise as a semi-formal but private blog to be read by my wife only, and to cover only those albums which have topped the chart during my wife’s lifetime. 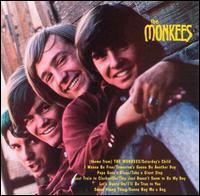 The Monkees’ debut album would have been the first “new” album to make number one in this period – just as “I’m A Believer” was the number one single at the time of Lena’s birth – and after some debate about whether or not to include The Sound Of Music (the album which actually was number one on the day she was born), we initially agreed for convenience’s sake to stick with the Monkees and proceed from there. However, following fuller and wider discussion with Lena and others, I felt that it would be no bad thing to open the concept up further and try to tackle the lot. So, almost a year after I embarked on this story, I have reached its “starting” point and certainly do not regret taking in the whole picture, since it has been educational in more ways than one. Moreover, I have done my best to minimise any “personal” or autobiographical content; readers curious about the latter are directed to any of my blogs listed under the “Previous Form” heading at the top of this page. The Monkees, as a record, is a perhaps unexpectedly rich starting point for a lot of things. But, in the beginning, it is worth briefly considering the supposed evil that svengalis do (especially given the hidden “evil” scrambled amidst that word) and wondering whether all svengalis, in the music business or elsewhere, are necessarily puppetising demons. Although this is the first number one album of 1967, The Monkees is at its core a 1966 record, and already gives indications that among their supposed controllers, artists as well as artisans were at work. There was, of course, another American-based group with a strange British member who were assembled by an arty svengali intent on stirring things up as well as making a living in 1966. That the Velvet Underground have gone on to be lionised and elder statesmenised was always going to be inevitable; but listening to Jimmy Bryant’s fiddle scraping dronefully away in perfect John Cale fashion throughout Mike Nesmith’s “Sweet Young Thing” is in itself enough to startle me into rethinking history. Moreover, the glockenspiel pacificity of Davy Jones’ “I’ll Be True To You” – a song previously a UK top ten hit for the Hollies in early 1965 under the title “Yes I Will” - complete with grave low register vocals and a moderately menacing spoken interlude, would, if sung by Nico, have long since been revered as a spacious classic. But it is not easy or convenient to consider Bob Rafelson and Bert Schneider in the same hall of glowering mirrors as Warhol, even though both had their uncommon ambitions. I am unsure whether they viewed the Monkees, as David Thomson has argued, as their Dada project, but both were frustrated aesthetes with a lot of time and money to spend on correcting the perceived deficit. Mickey Dolenz has recalled how, when he attended for his Monkees audition, he was faced with a room full of Coca-Cola bottles, behind which the impassive heads of Rafelson and Schneider were barely visible. He eyed both producers and bottles briefly before casually moving one of the bottles a little further down the row and announcing: “Checkmate.” The thinking was rightly light as well as lateral and the job was his. There is no question that the early Monkees music bears a general lightness – though using arguably heavier arrangements and musical set-ups – which was increasingly becoming absent from the work of the Beatles, and that this was the light which drew a few of Larkin’s fabled Cavern cloakroom girls into the Monkees’ embrace; the light itself may have refracted back onto the Beatles, given the very marked lightness of their next major work. The Monkees’ music, however, has very little in common with that of the Beatles. Their theme song does have elements of “Can’t Buy Me Love”’s swing but owes considerably more to the Dave Clark Five’s “Catch Us If You Can”; similarly, the ecstatic jumpcuts of the verses of “This Just Doesn’t Seem To Be My Day” are clearly modelled on “I’ve Just Seen A Face,” and there is a case for “Clarksville” being a speeded-up, de-neuroticised “Ticket To Ride” (and, unlike “Ticket To Ride,” the song bears a gleam of hope in Dolenz’s “I’ve made your reservation” in its final verse). Listening to The Monkees, however, suggests an entirely different approach to pop. In particular there is a definite folk-rock aspect to its dozen songs, but a different kind of folk-rock from that popularised by the Byrds; in Nesmith’s songs in particular there is more than a hint of what was shortly to come from Buffalo Springfield – as Stephen Stills narrowly missed the Monkees cut and Neil Young contributed guitar to some of the group’s later 1967 tracks, this is not entirely surprising. Equally, however, there are signs of a grander fusion; “Papa Gene’s Blues,” written and produced by Nesmith and featuring a stellar cast – James Burton, Glen Campbell and Tork himself (at Nesmith’s insistence) among the guitarists, Hal Blaine and Jim Gordon on drums, etc. – offers an unlikely paradigm for Latin-folk fusion with its busy, multidirectional percussion working alongside Nesmith’s so-laid-back-he’s-horizontal lead vocal. Nesmith’s voice is noticeably more boisterous on “Sweet Young Thing” and seems to be approaching the territory of Arthur Lee (though co-writing the song with Goffin and King, at the insistence of Don Kirshner, may account for his exhausted sigh at song’s end); indeed, Tommy Boyce and Bobby Hart, then the group’s principal songwriters and producers, are on record as stating that they were seeking with the Monkees to emulate the sound of LA bands of the period such as Love and (thankfully not evident at all) the Doors. The Monkees theme itself, of course, despite (or because of) its peremptory door-slamming tympani thud of an intro, is all about lightness of approach and mind; they’ve got something to say but in truth are not too bothered about whether you listen to them or not, as demonstrated by Dolenz’s fractured “ahhh…” into a strange, brief reverb/feedback interlude before the song resumes its frantic, key-chasing cheerleader strut, complete with finger snaps and cymbals on which vinegar could sizzle. Still, did any album of this period begin which as forcible a self-advertisement? They were quickly creating their own mythology, and the cartoon aspect is carried over into tracks like “Let’s Dance On,” in which Dolenz excitedly goes through the Pony/Jerk card while other voices whoop (“Wooh!”) around him, a harmonica blasts its way out of the furnace, Spector’s “Be My Baby” bass drum/tambourine pattern briefly muscles its way into the picture, Hart contributes an earsplitting Vox Continental solo, and the general punk jumparound and, above all, the concluding cry of “Hey hey hey HEY!” reveal the truth – here we are witnessing the embryo of the Ramones. “Saturday’s Child” continues this modified strain of garage rock, with drums stumbling out of its choruses, luminous 6/8 guitar triplets, the disorientated “She looks at meeeee….” which slows down to a reeling pause before restarting, the very dirty guitar playing of one or two or all of Louie Shelton, Wayne Erwin and Gerry McGee (all outstanding throughout the album) and the momentary forgetting that the song was written by David Gates. In contrast, Jones tremulously fumbles his Peter Noone-waylaid-in-a-Bolton-side street choirboy way through the ballad “I Wanna Be Free,” slightly off pitch but very touching (particularly on the moving “Say you like me”) as harpsichord and string quartet couch his quiet distress. “Tomorrow’s Gonna Be Another Day” bears some superficial resemblance to what the Stones were doing at that time – both bands were using RCA’s Hollywood studios – but the swampy guitar exchanges are of a different fibre to those of Brian and Keith, the harmonica slightly more buried in the mix and Dolenz’s self-swallowing echo on the word “day” not really related to any Stone masonry. With “This Just Doesn’t Seem…” the rules (if indeed there were any in the first place) get cut loose into the Pacific Ocean as we witness bitonal Indian-style interludes – with a ‘cello acting as feedback – and the aforementioned, careering “I’ve Just Seen A Face”-type swoon, Davy in his element, before in turn becoming a proto-psych rock workout, the ‘cello still prominent, and then resolving with Jones’ dazed “Oh my, oh my” over a ticking clock. Whatever Bobby Hart’s day band the Candy Store Prophets sounded like, this sounds like prophecy of a different order. The album ends as only this album could; everyone from Kirshner on down realised “Gonna Buy Me A Dog” was a joke of a song and so the “goof” version was selected over the “straight” reading. Starting out as a lumbering 12-bar blues, Dolenz initially attempts to deliver the lyrics with a straight a face as is permissible, but Jones is soon distracting him: “You’re gonna need all the friends you can get, I’m telling you,” he grins, and Dolenz loses his countenance. “I can’t teach your dog to do that!” he giggles, while Jones snickers about the need to “train elephants” (a reference to Dolenz’s previous life as the juvenile star of the TV series Circus Boy). Comparable with the Velvets’ “Temptation Inside Your Heart” (though recorded two years earlier), the track eventually collapses in hilarious chaos, Dolenz’s offhanded “yeah, yeah”s balancing out Jones’ cries of “Can someone open the door and let us out? We’ve been in the studio far too long!” and recitation of increasingly absurd dance crazes. Too busy singing to put anybody down, generously overlooking the funniest looks they get, an uncaring cheerfulness that should never be confused with not caring, The Monkees revolves us into a 1967 dawn of perfect sunshine, the ideal introduction to all the colour to follow. What a world to be born into. thanks again marcello - the monkees were my first pop experience that wasn't filtered through my parents tastes and I'm always pleasantly surprised at how fresh they sound. Your appraisal makes me want to go out and buy the record. Thanks to everyone who's sent Spotify and other links; all useful and I'm keeping them for future reference/posting but for entirely unreasonable reasons I'm a bit reluctant to put them all down here at the moment ;-) Best if you send the links to me at my email address, viz. marcellocarlin at hotmail dot com, and I'll post them as and when.